Mowing goes hand in hand with maintenance of a lawn, regardless if the grass is a warm-season or cool-season species. 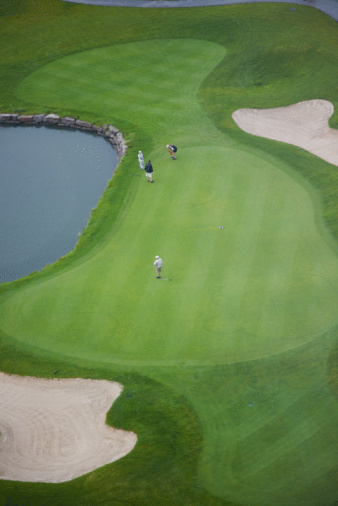 Fertile soil that contains nitrogen, trace amounts of iron and ample moisture promotes the growth of deep-green grass. If the lawn looks yellow-green after the weekly mowing, it likely suggests a needed change in your maintenance practices. Mowing a lawn too short often causes an unattractive yellow-looking hue. Lawn grasses grow from a thick, coarse lower-stem shaft called a sheath. The sheath often looks tan to yellow in color. From the sheath arises the green leaf blade. Mowing the lawn cuts off the top of the leaf blade. The blade does not grow from the tip, but elongates as it pushes out from the top of the sheath. The more leaf blade present, the greener the grass plant looks. The lawnmower should never cut into the sheaths in the lower portion of grass. Proper mowing height prevents mowing too much green leaf blade away and exposing the yellowy sheaths. Never cut off more than one-third the total grass height during mowing. Cutting off too much leaf blade leads to yellowing of the lower leaf blade. For example, if you want a lawn that is 3-inches tall after mowing, mow it when the lawn reaches no more than 4-inches tall. If the lawn happens to grow out of control and get tall, do not chop down the lawn very low to save time, as it exposes sheath and removes most if not all of the green portions of the leaf blades. Waiting too long to mow lawns often leads to large amounts of grass clippings that settle on the lawn. Small amounts of shredded clippings are beneficial to lawns since the clippings decompose and provide nitrogen to the roots in a thatch layer no greater than 1/2-inch thick. Improper mowing exacerbates the buildup of thatch on lawns, especially on Bermuda grass, fescue and bluegrass lawns. The thatch turns beige in color and shades the grass plant's sheath and lower leaf blade. Exposing thatch makes a low look beige to yellow -- again the result of mowing too short or at too long of intervals as the grass grows. 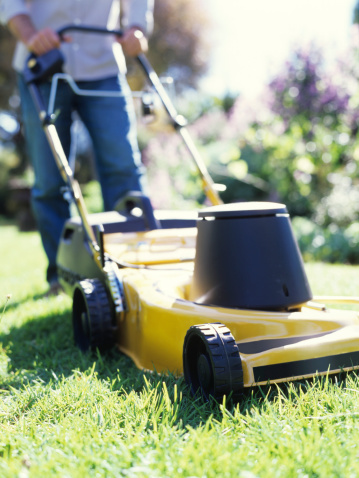 If a lawn looks peaked and yellow after mowing, it could also be caused by dry soil or sunscald. The green leaf blades photosynthesize light and shade the soil and lower portion of the grass plants. Cutting off the blades can expose lower, less green portions of the leaf blade and sheath, resulting in some wilting and yellowing. Soil low in nitrogen may also cause parts of the grass to look less green than normal. Lawn grass weakened by drought will not grow as quickly or thickly, making the lawn look more yellow. During the heat of summer or seasonal drought, raise the height of the lawnmower's cutting blades.